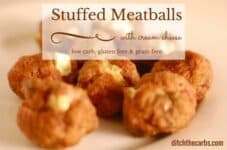 Cream cheese stuffed meatballs, now what’s not to love about that combo? Perfect for a protein and healthy fat hot, perfect for a snack or a full meal. These are what dreams are made of. Low carb cream cheese stuffed meatballs. They are quick to make, economical, perfect as a snack, lunch, dinner, breakfast (you know I think leftovers are King!) and can be frozen. So why not make a double, triple batch and be prepared for the weeks ahead. How about serving them on a platter as an appetiser, on bamboo sticks, or warm them up on the barbecue in summer. They can be served hot or cold, with or without dips. They would go brilliantly with my low carb curry coconut dipping sauce. And as for a quick protein snack, they are portable and sturdy to carry around. You can even adapt the filling to your liking. How about feta and basil? Blue cheese? Haloumi? Chives? Mozzarella and pepperoni? The possibilities are endless. I try to make my recipes as adaptable asp possible. It’s about giving you ideas, about thinking differently. Leave a comment with your fabulous idea for a new stuffing combo. 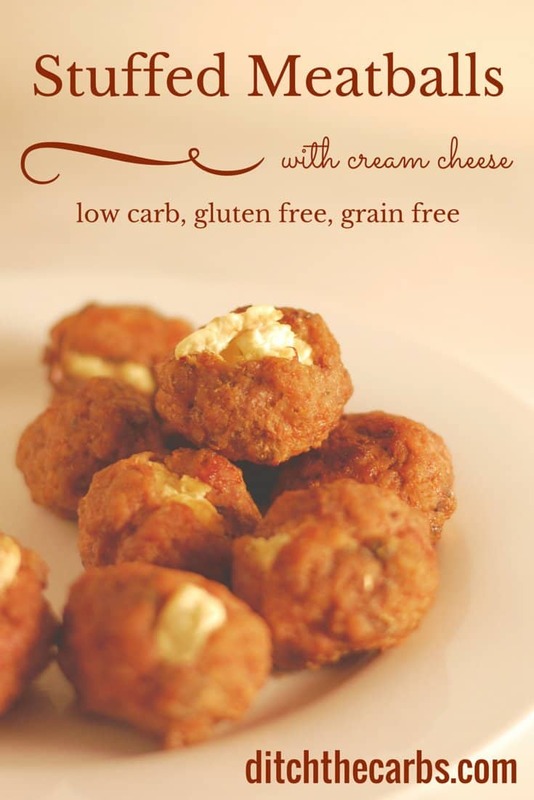 Cream cheese stuffed meatballs are perfect for dinner, lunch, a snack or an appetiser. So make plenty and keep on hand for a quick protein punch. Place all the meatball ingredients on a large mixing bowl. Mix thoroughly with your hands. Using a dessert spoon, scoop up a golfball size of meatball mixture. Squeeze the mixture into a ball then flatten into a circle. Place a cube of cream cheese in the centre of the meatball circle then enclose the meatball mixture around the cream cheese.Place the cream cheese stuffed meatball on a greased baking tray. Repeat until all the mixture has been used. Spray them all with olive oil spray so they will crisp and brown beautifully. Bake at 180C/350F for 15-20minutes depending on your oven, or until golden brown. I have one in my household that doesn’t like cream cheese could I sub with riccota, mozzarella, or some other kind of cheese ? Wasn’t especially found of these. There was no binding agent to keep them together and they actually tasted a bit bland. The fat from the bacon caused a bit of a gelatinous goo to form along the bottom as they cooked as well. I would recommend trimming some of the fat off the bacon to keep that from happening. This recipe looks fabulous! My son is allergic to tomatoes, any suggestions for a substitution? 15-20 minutes doesn’t sound like it would be long enough to cook the meatballs thru. Has anyone tried these with ground beef and did they cook that quickly? Thank you Libby. I must try the recipe. To get my girl to have some cheese. How many meatballs in a serving? These look delicious! The recipe makes 25 meatballs, the nutrition panel is per meatball. Some might serve these as a dinner, others might have them as a snack so hard to say how many you would like as a “serving size”. Hi Libby, I would like to make these meatballs as part of a dinner I’m preparing for Easter Sunday, and am just wondering about the sun dried tomatoes. You normally show pics of the products you use, but this recipe only has the link to Amazon with no pics. I’m curious about the sun dried tomatoes, as I went to buy a jar from Woolies, and they were really high in carbs, so wondered if there is a particular brand you recommend. I’m in Australia, by the way. I buy the sun-dried tomatoes that come in a packet, then when I get home I chop them with kitchen scissors and pop in a jar. I cover them with olive oil. They are now ready to sprinkle over a salad or to cook with, and the olive oil by the end is amazing as a salad dressing. I used to buy them pre-sliced but discovered they use vegetable oils, and I avoid those. Sun-dried tomatoes are higher in carbs because they are concentrated tomatoes but they are packed with flavour and you only use a small number to flavour a recipe. Likewise with tomato paste, higher in carbs, but a little goes a long way. If I were to freeze them, should I cook them first? Any ideas of best way to reheat after frozen? Yes, I would cook them first, then all you have to do is defrost a few at a time. Otherwise you’re popping the oven on each time which is a hassle. To reheat, either microwave until hot in the centre (not too long, you don’t want rubbery meatballs) or if you were to have the oven on cooking something else, pop them in for 5 minutes to heat throughout. Do you just slice the onion or is it finely diced? I slice it so I can see little circles of spring onion in the recipe. You can finely dice it if you want it to be more subtle. These taste awesome! I made a bunch of recipes yesterday and had these in the oven while I was getting on with something else. I forgot to set a timer and in the end I burnt them quite a lot and they still tasted really good! Loving that combination of diced bacon and sundried tomatoes you add to your mince recipes, great flavours. If I wanted to use mozzarella cheese, what kind would be best? My first thought was the whole milk mini mozzarella balls, but those are so soft. Maybe a harder mozzarella would be better? Also, I’m not a fan of sun dried tomatoes. Any suggestions on a replacement? Probably the harder mozzarella would be best. It really needs a firm cheese inside the meatballs otherwise the cheese will be squeezed out when you roll the balls into shape. You can omit the sundried tomatoes altogether. Maybe replace it with diced pepperoni? 2 tbsp in total (or add to your liking). I would like to make these with lamb. Can you recommend either a good herb with the cream cheese or another cheese that would melt inside the meatball and complement the lamb? Sorry if this question is a little dumb but I don’t cook, just dabble once in a while and this recipe caught my imagination. How about mint and rosemary in the meat, and helium cheese cube inside? That would be incredible. Oh my! These were SO tasty – and definitely will do again and try different combinations. I might try putting under the broiler to finish off/make them a bit browner at end? Thoughts? For sure, that would be great. These sound amazeballs! 😉 They are now on my to-do-list for this weekend! 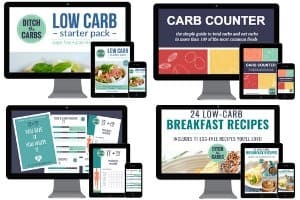 Any ideas for a low carb vegetarian version? Does it really get any better than that! I’m going to make these tomorrow. Do you need to pre heat the oven @350? Hi There. Am inspired. Thank you for sharing your ideas. Nope! The bacon will cook as the meatballs do. Yuuuuuuuuuuuuuuuuuuuuuuuuuuuuuuuuuuuuum! I NNED these in my life! And my kids might be able to even eat them since they have only a little bit of dairy in them! YAY!!! You could even fill them with non dairy fillings such as pepperoni and tomatoes paste (there’s a pizza ball right there). I’m sure others can suggest even more dairy free options – ready people – GO.